Crafting Civilian Control of the Military in Venezuela: A Comparative Perspective. Harold A. Trinkunas. Chapel Hill, NC: University of North Carolina Press, 2005. According to Harold A. Trinkunas, a professor of national security affairs at the Naval Postgraduate School, "The contemporary Venezuelan experience addresses two key issues in the debate on democratization: How do democracies achieve control over their armed forces? And how do they lose this control over their armed forces once they have achieved it?" 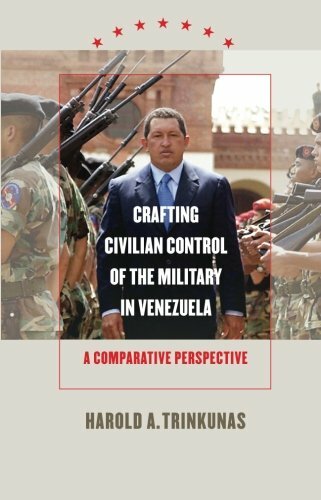 To demonstrate this claim, he has written Crafting Civilian Control of the Military in Venezuela: A Comparative Perspective, an interesting if imperfect contribution to the literature on civil-military relations. Trinkunas begins this foray into the academic literature on the civil-military problematique with a discussion of definitions and the development of a framework describing the relationship between democratic regimes and the strategies they pursue in establishing control over their militaries. To begin, he states, “Civilian control exists when government officials have authority over decisions concerning the missions, organizations, and employment of a state’s military means. Civilian control also requires that officials have broad decision-making authority over state policy, free from military interference.” In using this definition, Trinkunas consciously (and usefully) distances himself from Samuel Huntington’s classic concepts of objective and subjective control. The model presented here diverges from subjective control via the means by which it is achieved, shifting from Huntington’s prescription of aligning the values and objectives of the military with civilian leadership and society and suggesting a more positive approach. This approach, derived from the historical record, involves techniques such as appeasement (satisfying the interests of the military, especially the officer corps, in the hopes of discouraging uprising or interference in political matters), monitoring (to forewarn of incipient issues and facilitate intervention to forestall military dissension), division (creating and exploiting cleavages within the military to limit capacity for dissension), and sanction/punishment (using fear of repercussions to induce cooperation from the military). Then, rather than eschewing Huntington’s objective control, the Trinkunas model essentially subsumes it within a larger framework of choices a regime can make in seeking civilian control. This framework relies on the leverage a regime has over the military instrument (not well-defined by Trinkunas, but loosely the power to enforce compliance) and the capacity of the regime (defined as “the combination of political leadership, institutional resources, and expert civilian personnel specifically and exclusively committed to matters of civilian control and national defense”). With these definitions and model in hand, Trinkunas delves into the Venezuelan historical case studies that form the bulk of his analysis. He begins with the attempt at Venezuelan democratization between 1945 and 1948 that ended in a reversion to military dictatorship. The losers in that failed attempt at democratization got another chance in 1958, and Trinkunas provides a detailed analysis of the coup and the subsequent democratic transition, a transition that exploited the civil-military lessons of the earlier failure. This is followed by a thorough analysis of the ongoing Venezuelan civil-military dialogue from 1958 to 1973, when Venezuela’s counterinsurgency era nominally ended and civilian control over the Venezuelan military was in some sense consolidated. Then, a deep look at two failed military coups, both in 1992, illustrates the challenges to Venezuelan civil-military relations that emerged in the late 20th century. One of these coups was led by Hugo Chávez, and Trinkunas spends another chapter exploring his influence on the relationship between the Venezuelan civil government and the military between his election to the Presidency in 1998 and the recall referendum the Chávez regime survived in 2004, a result that cemented his control over the military. These analyses highlight the relationship between regime leverage and the strategies pursued by the Venezuelan government. We see a failed attempt at containment by a nascent regime in 1948 that lacked both leverage and capacity. We see the exploitation of military divisions to create regime leverage in 1958 and establish a democratic government that lacked capacity but could contain the military instrument. We see the use of personal relationships to establish the capacity to monitor the military instrument in the years between 1958 and 1973 when the regime lacked capacity. And we see the general trajectory of civil-military issues in which the Venezuelan military has been engaged (external defense, internal security, public policy, and state leadership) over time. This history is fascinating and detailed, rich in context and nuance, but a trend emerges in all of the above. The reader should note the centrality of Venezuela to each of the given cases. Further, the reader should note the absence of a case in which Venezuela exhibited significant regime capacity. That is, Trinkunas includes cases of both high and low regime leverage, but only cases in which the civil government lacked “the combination of political leadership, institutional resources, and expert civilian personnel specifically and exclusively committed to matters of civilian control and national defense” that defines capacity. He therefore cannot illustrate via a Venezuelan example cases in which the state pursued control over the military via effective oversight or effective appeasement and monitoring strategies, strategies. So, half of the analytic cases developed in his model are missing in the Venezuelan history presented by Trinkunas. This constitutes a critical weakness in the work, and while Trinkunas attempts to fill the clear gap by examining cases from Argentina, Chile, and Spain, this evidence—presented over the course of barely half a chapter sandwiched into the conclusions—is thin. The result is less comparative and more a thin supplement, and the author’s claims to have demonstrated that “transitions away from military dictatorship and toward democracy create an opportunity to craft civilian control” with the weakest strategy appeasement, more robust strategies involving monitoring and division, and the strongest strategies a high level of oversight combined with sanctions is at least problematic. Moreover, his general conclusions that “the nature of the opportunity structure does not overdetermine the outcome” (i.e., monocausal explanations are problematic), that civilian strategic choices matter in the outcomes of efforts at establishing civilian control, etc., are, while hardly surprising, poorly supported by the case-study evidence provided. And rather than a general theory of civil-military relations in democratizing states, Trinkunas provides a very nice description of civil-military relations in Venezuela and the suggestion that it appears strategies of oversight, never used in Venezuela, might be broadly advantageous. It is important to view the civil-military problematique through a lens slightly different from that of the United States looking at itself. In this regard, Trinkunas has offered a useful addition to the literature on civil-military relations. And as a history of political transitions, coups, democracy, and civil-military relations in Venezuela from 1945 to 2004, he does not disappoint. But the book doesn't live up to the author's aspirations. In the end, the notion presented of an ideal civil-military relationship is a hard row to hoe, the hypotheses were hard to find (until the last chapter where he advances problematic claims that the hypotehses were proven), the model and hypotheses don't appear to add much to the theoretical literature, and the conclusions that are drawn either don't extend much beyond Venezuela (in the evidence given) or fall largely into the category of the obvious. So, Crafting Civilian Control of the Military in Venezuela is a failure, I think, but a successful one. Eric M. Murphy is a mathematician, operations research analyst, and strategist for the United States Air Force. He is also an Editor at The Strategy Bridge. The conclusions and opinions expressed in this article are his alone and do not reflect the official position of the U.S. Air Force, the Department of Defense, or the U.S. Government. Harold A. Trinkunas, Crafting Civilian Control of the Military in Venezuela: A Comparative Perspective (Chapel Hill, NC: The University of North Carolina Press, 2005), 2.